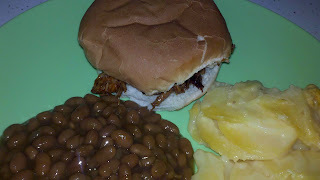 You probably don't remember it but a few weeks ago I mentioned in my Menu Plan Monday post that I was going to do a Leftover Redo for supper and make BBQ chicken using leftover chicken breasts from Sunshine's birthday party. In fact that entire meal was made up of leftovers from her party. Here's how I made the BBQ chicken sandwiches from the leftover chicken breasts. We had about 8 chicken breasts that were leftover. They already had barbecue sauce on them from where we cooked them on the grill but you can use chicken breasts that are plain, as you will add more barbecue sauce later. I put all of the chicken breasts in my crockpot and turned it on low. I let them cook for 3 hours, and by then they were pretty tender. I used a fork to pull the breasts apart, and then put them back into the crockpot after they had been shredded. I also stirred in a bottle of store bought barbecue sauce and let the chicken cook on low for another hour before serving them. This made enough sandwiches for the five of us to each have two, plus there was about a spoonful of leftovers. which is at At The Well this week instead of Blessed With Grace. To work or not to work? That is the question!